When you consider all the building companies that come and go, being around for nearly nine decades, may sound like quite a feat. Well, truth be told, it is! But we don’t take time to pat ourselves on the back. Instead, we are busy researching new technologies and procedures or talking to industry leaders to ensure that we are always on the cutting edge of construction. We do this because we know that to stay around for another eighty years, we have to do things better and faster than the competition. We believe strongly in the integrity of the work we do. In an industry where you rarely get second chances, most of our business comes to us through referrals and repeat customers. We have been doing roofs for some of our customers for 40 or 50 years! When you call M. Rosenblatt Roofing for any job, we come out to look at the property and then put together a proposal that includes every detail. There are no hidden fees. Once the customer signs off on a job, we get all of the proper permits and take care of all the paperwork with the township. Even when we are done with a job, we are still in contact with the customer. Our friendly office staff follows up to answer any questions and to make sure we exceeded your expectations. 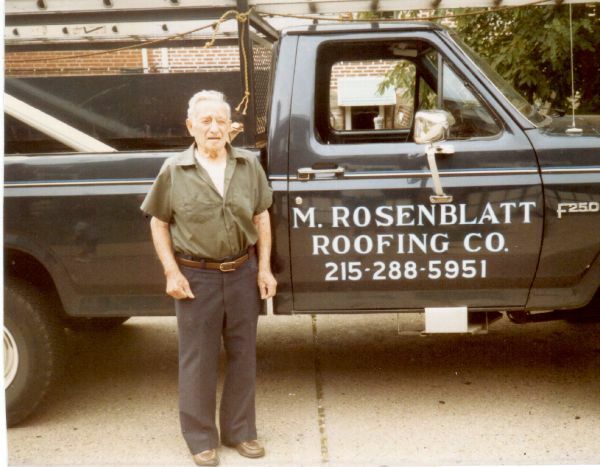 In 1929, Morris Rosenblatt started a one-man roofing business in the bustling city of Philadelphia. As the Great Depression began, Morris made it his mission to provide affordable homebuilding services to the people most affected by economic hardships. Armed only with a push cart and some tools, he set out to do the impossible...help families weather the storm and protect their dreams! That tradition continues today with the 4th generation of this family owned and operated business. Even though technology, materials, and services provided have changed, our family's commitment to service, safety and satisfaction has endured. To this day, M. Rosenblatt Roofing strives to provide a good balance of quality, integrity, and affordability to all its customers. When Morris Rosenblatt first started back in 1929, he specialized solely in roofs. Although roofs of all kinds is still the company's specialty, we have evolved into a full service home improvement company. There isn't a job that is too big or too small and we cater to the specific needs of each and every customer. As my dad likes to say "We can tailor the suit to fit their needs". At M. Rosenblatt Roofing & Siding, our workers are the best in the business. We have a very low turnover rate with our employees. Some of our team members have been with us for over 30 years! That is virtually unheard of in this industry! We even have an engineer on staff to handle complex issues. In addition, we require all of our team members to undergo comprehensive and continuous skill and safety enhancement trainings. Our technicians have been certified by some of the industry's largest and most respected manufacturers. We believe that making our people more knowledgeable not only allows them to grow in their careers, but also offers a direct benefit to our customers. 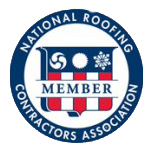 Although specific team members excel in certain areas, everyone is well-rounded and fully trained in all facets of residential and commercial roofing and home improvement. Because our skilled team comes from a diverse background, we are able to competently provide services to many customer segments including residential, commercial and industrial. All of our employees live in the same communities in which we work. Giving back to the people in the community is something that is very important to us! We sponser a little leauge team in South Jersey, support our local police and fire departments, and have giveaways on our facebook page. So be sure to like us on Facebook for a chance to win one of our giveaways! We also believe in keeping the environment clean for future generations. Because of this belief, we have achieved our newest certification, GAF Certified Green Roofer. In both our residential and commercial jobs, we are committed to recycling as much roofing material as possible to keep additional waste out of landfills. In America, 92% of roads are asphalt. Therefore, the biggest use for old asphalt shingles is to turn them into roads. An average size roof is approximately 30-35 squares or 3.5 tons. After the old roofing shingles are taken off, there are basically two choices for what to do with them. The first, which is what most contractors do, is to send them to the landfill where they take up about 5 cubic yards of space, which is equivalent to the amount of trash generated by a family over the course of a year! The second choice, which we are currently doing, is to take them to a shingle recycling center which converts the shingles into the raw materials necessary for ashpalt roads. The same amount of old roofing material that takes up 5 cubic yards of space in a landfill, once recycled, will pave 50 feet of road. Where would you like to see the old shingles go?